Please note that all paintings listed by Artist Codes 0000 to 0020 were painted prior to my turning professional. I started to number them in this way not in any particular order, then realized that if I was to be a professional, I needed to have a proper coding practice. So I decided after these 21 pictures that I would have four-digit Artist Codes, the first two digits representing the year, and the second two digits the order in which I either painted or sketched the artworks (not necessarily completing them at the time), i.e. “1023” was painted in 2010 and was number 23 of 23 paintings started during that year. SOLD to original commissioner in 1984; RE-SOLD from my website in July 2013 to private collector in Australia. 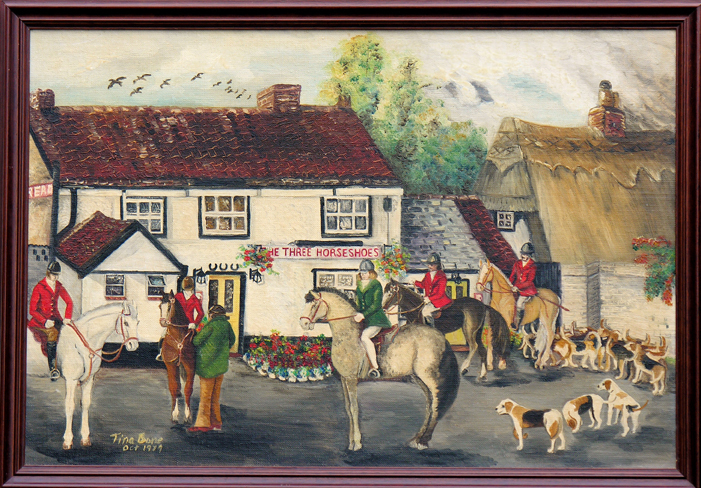 Although commissioned by the landlady of the Three Horseshoes Public House, Comberton, near Cambridge in late 1983, for reasons unknown this painting lay in storage, unframed, until late 2003. 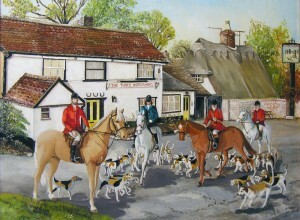 In 1984, a print had been produced to hang in the pub and the original went with the commissioner when she left the pub. The painting (still in new condition) was returned to the artist late in 2003. It was then framed and put back into storage. 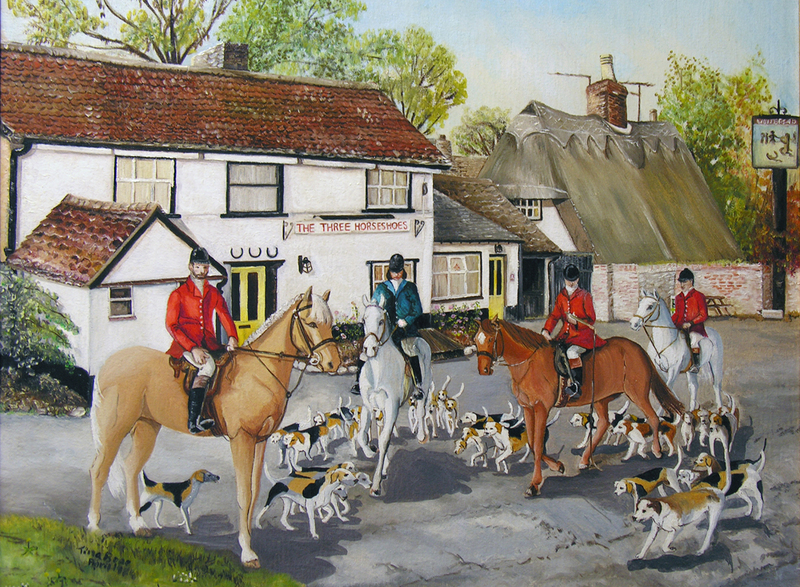 The commission commemorated the final Meeting of the Cambridgeshire Hunt at the pub, and is historic in that the ‘Shoes’ (as it is affectionately known by the locals) has altered somewhat since 1984. “Ablast from the past”—whilst sifting through some old papers I discovered a newspaper clipping of a pen and ink study I had produced for the first oil painting commission of the pub (this is the fourth painting I have done of it), published by the Cambridge Evening News in September 1979! This is the second painting of the four of this scene. Painted in 1981; the first one being in 1979.